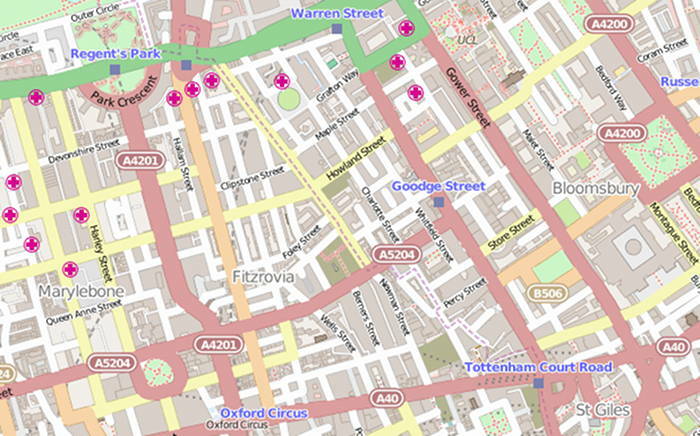 There were 13 planning applications validated in the Westminster part of Fitzrovia between 13 July and 2 August 2015. There were no new licensing applications. Erection of a mansard roof extension to accommodate a new self contained 1-bed flat to fully complete previously part-implemented, consented scheme 96/04136/FULL. Variation of Condition 2 of planning permission dated 02 March 2015 (RN: 15/00298) “Variation of Condition 5 of planning permission dated 13 March 2014 (RN: 14/00724) for use of the public highway for the placing of three tables and eight chairs in two areas measuring 3.5m x 1.5m and 1.6m x 1.5m in connection with the existing public house; NAMELY to permit the extended use of the public highway until 31 March 2016.” NAMELY, AMEND THE APPROVED LAYOUT OF THE TABLES AND CHAIRS. Alterations to entrance frontage at ground floor level. Display of internally illuminated (letters only) fascia sign measuring 6.5m x 0.05m and internally illuminated (letters only) projecting sign measuring 0.6m x 0.6m. Use as mixed use coffee shop Class A1/A3 (Sui Generis) at ground floor level. (Retrospective Application). Variation of Condition 3 of planning permission dated 18 November 2014 (RN: 14/09012) for the use of the public highway for the placing of two tables, four chairs and two fabric barriers in an area measuring 1.7m x 1.7m in connection with the existing ground floor use, NAMELY, to correlate the placing of tables and chairs with store timings (currently 07.30-18.00 daily; new proposed hours 07.30-19.00 daily). Use of ground floor unit as a retail (Class A1) and beauty salon (Class D1) uses. Variation to Condition 8 of planning permission dated 3 March 2015 (RN: 15/00296/FULL) for ‘Removal of Condition 15 of planning permission dated 07 November 2013 (RN: 13/03339) for, ‘Alterations including erection of a fifth floor mansard roof extension and installation of new and replacement windows to the rear, creation of roof terraces and use of the first to fifth floors as eight flats (Class C3). Alterations to the Great Portland Street, New Cavendish Street and Bolsover Street elevations including the alterations and replacement of windows, installation of new shopfronts and the creation of a new entrance in connection with the provision of additional retail floorspace to create two shops (Class A1); installation of plant’; namely, to remove the requirement to provide and retain the photovoltaic panels shown on the approved drawings’; Namely revision to approved plans to allow extension of terraces to roof level in connection with Flats 7 and 8. [Site includes 136 and 138 Great Portland Street]. Formation of a new opening 910mm wide by 2100mm high in the basement and new internal partitions at basement and ground floor. Use first floor level for hairdresser salon, in association with the existing salon at ground floor level (Class A1). Use of the ground and basement premises as retail accommodation (Class A1). Use of the public highway measuring 4.4m x 2m for the placing of 8 tables and 16 chairs in connection with the ground floor use. Installation of new shopfront with openable windows.